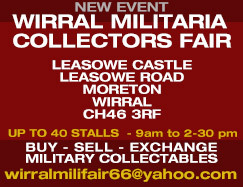 The Fairs are a superb opportunity for dealers or collectors with excess items in their collections to exhibit their collectables to collectors in superb surroundings with a friendly atmosphere in an area that has not previously hosted a Militaria Fair. The quality advertising in magazines such as The Armourer, The Armourer International Militaria Collectors Guide, Gun Mart, Classic Military Vehicle, The Medal News and Lancashire Evening Post will generate very good interest from the collecting fraternity and the general public/veterans. In addition, a large amount of quality A5 colour leaflets are being handed out at many Arms Fairs which will, we hope attract many quality dealers to use the venue. Preston Arms, Medal and Militaria Fair invites all types and eras of Military Vehicles to the venue, a secure area of the car park will be made available for these amazing historical vehicles. All vehicles must be booked in advance to ensure space is available. Dealers that wish to have their details advertised on our website we will be pleased to do so, and links to our website are also welcomed. During each fair our professional photographer will photograph items for sale, with the permission of the vendor of course, and will create a section of the website to show interested parties the type of items to be found at our venues. In addition to the range of collectables on offer, there will be high quality reference books for sale, an important element of these events.